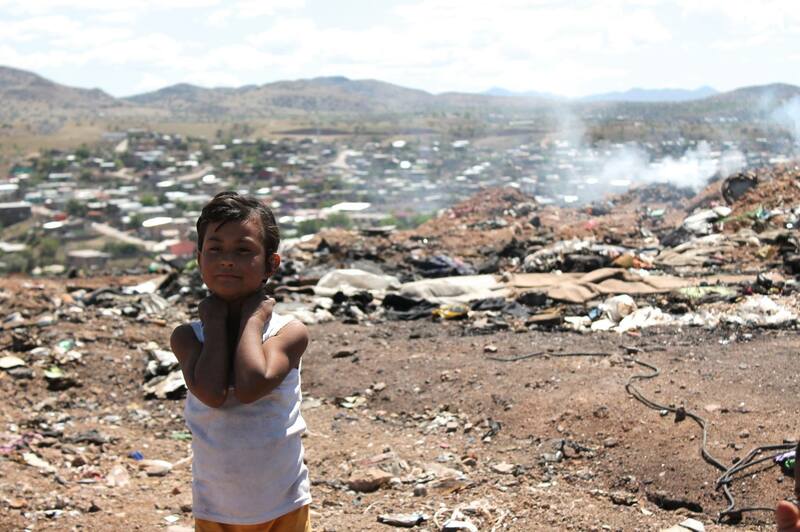 Five-year-old Daniela Sandoval plays in el Tirabichi, an open dump in Nogales, Sonora, where her mother scavenges. Behind her, a fire that killed one person and destroyed a dozen makeshift homes continues to smolder. Photo by Perla Trevizo/Arizona Daily Star. They tear sofas apart for the metal, burn Christmas lights for the copper and salvage old plastic toys. They work fast to dodge bulldozers that load trash into semitrucks for a one-way trip to the landfill. Slogging through knee-deep muck, they grab whatever they can: bottles, boxes, clothes. Most precious is copper, which can sell for about $4 a kilo, roughly two pounds — nearly 10 times as much as paper. They sort what they collect and wait for the next pickup or municipal garbage truck to grind its way up the dusty road to the dump. If they’re lucky and they had a good day or a driver gives them some meat, they light a fire and cook it up. When there’s nothing to do, they sit on discarded furniture or use old boxes to shield themselves from sun and rain. Waste pickers can live their entire lives at el Tirabichi, as the locals call it. Some live in houses local charities or church groups help them build on the hillside above the dump. Some live in tiny, mostly unfurnished homes made from cardboard, wood, tarp — discarded materials they find as they work. If they don’t find mattresses, they make beds out of old clothes. El Tirabichi is supposed to close by the end of June, the move prompted by a fire that ripped through in March and killed a man. The city will contract a private waste management company and most dump trucks will go to a newer transfer station and to the landfill on the other side of town. But some city dump trucks and private cars keep making their way here and dumping their loads. And waste pickers keep showing up and making their piles. They don’t see a choice. Many of them came here after being deported, dropped off at the border without a peso in their pocket. Some are drug addicts hoping to sell enough to finance their next fix. Some are parents, scavenging to feed their children. El Tirabichi is a refuge for the desperate. Continue reading at the Arizona Daily Star. Most single parents and their children who are caught at the border in Southern Arizona will be taken to Phoenix, where immigration officials will decide if they are released with a tracking ankle bracelet, a local agency said. Since last week, immigration officials told volunteers working with families that they will no longer be dropped off in Tucson, said Galen Hunt, an Americorps VISTA in-house volunteer with Catholic Community Services. This week they’ve only received two families. The local group owns the house where mostly women and children arrive. Volunteers help make travel arrangements to their final destination, where their immigration cases continue. “U.S. Immigration and Customs Enforcement makes custody determinations on a case-by-case basis with a priority for detention of serious criminal offenders and other individuals who pose a significant threat to public safety,” agency officials said in a written statement. “Those who are not subject to mandatory detention and don’t pose a threat to the community may be placed on some form of supervision as part of ICE’s Alternatives to Detention program,” it said. The Alternatives to Detention program places low-risk people under different forms of supervision or electronic monitoring rather than in detention, the agency said. The idea is to increase compliance with release conditions, so people show up to court and leave the country when they are supposed to. A local Tucson home that hosts families released by immigration officials has seen a slight increase in new arrivals, and volunteers want to make sure they are ready for what may come in case of a repeat of last year’s surge. They’ve seen occasional spikes since March, said Galen Hunt, an Americorps VISTA in-house volunteer with Catholic Community Services, which owns the house where mostly women and children arrive. Volunteers help make travel arrangements to their final destination, where their immigration cases continue. After hosting 116 families in December, Casa Alitas saw a decrease the following months, but it started to rise again in March and April, numbers show. The other day, he said, immigration officials dropped off more than a dozen families. The average family consists of a mother and a child, but occasionally a parent with up to three children arrives. Overall though, the number of immigrant families coming through is nowhere near last year’s rate. So far this fiscal year, the number of so-called family units caught by the Border Patrol along the Southwest border is down 35 percent, at nearly 17,000. 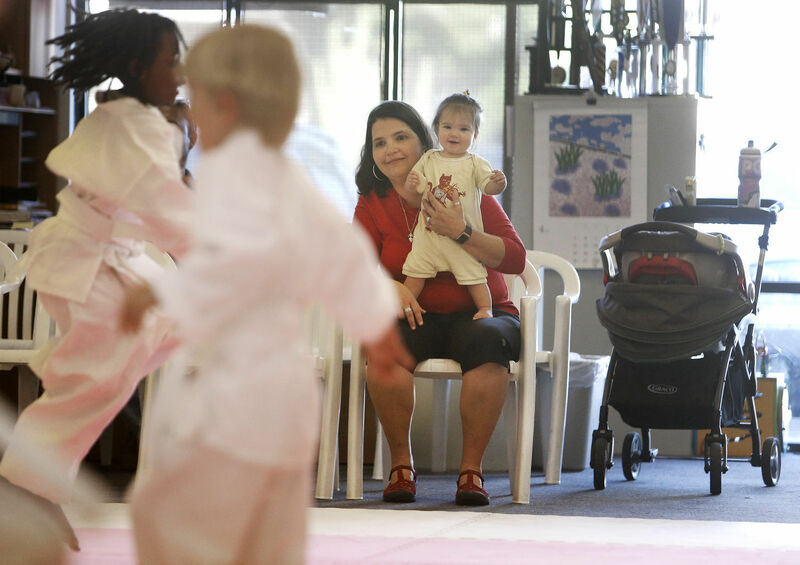 Patricia Espinoza holds her 1-year-old daughter, Paula Alvarez-Espinoza, during a class for her eldest daughter, Mariana Alvarez-Espinoza, 4, at Eastside Karate. The UA grad student and employee came to the United States from Cuba on a business visa. Photo by Mike Christy/Arizona Daily Star. Mexico has quietly become the main entry point for Cubans aiming to touch American soil, where they’re allowed to stay and apply for permanent residence a year later. The trend has accelerated over the past five years — long before President Obama began talks of normalizing relations with Cuba. The number of Cubans without a visa who present themselves at ports of entry along the Southwest border has increased from less than 6,000 in 2010 to 17,500 last fiscal year, Customs and Border Protection data show. As of December, the first quarter of the fiscal year, nearly 6,500 have come through Mexico. For Cubans who can afford it, hiring a smuggler to travel to Mexico is more effective and easier than taking a boat ride to Miami, said Marc Rosenblum, deputy director of the U.S. immigration policy program for the Migration Policy Institute. After an initial round of Cubans successfully made the journey through Mexico, he said, word spread of a potential new pathway and a smuggling system rose up to help migrants come to the United States. The same has happened with other migration patterns, like last summer’s surge in women and children arriving from Central America. The more than 2,000-mile journey from Cuba to the Cayman Islands, Honduras, Guatemala, Mexico and the U.S. border can take up to four months, with stops along the way to work and raise money for the next leg of the trip. As with other migrants, Cubans risk being kidnapped or deported along the way, and are often extorted by criminal gangs or the police. Gerardo Ramirez tried unsuccessfully to cross near Douglas using the cellphone method. He was quickly spotted by Border Patrol agents. Photo by A.E. Araiza/Arizona Daily Star. 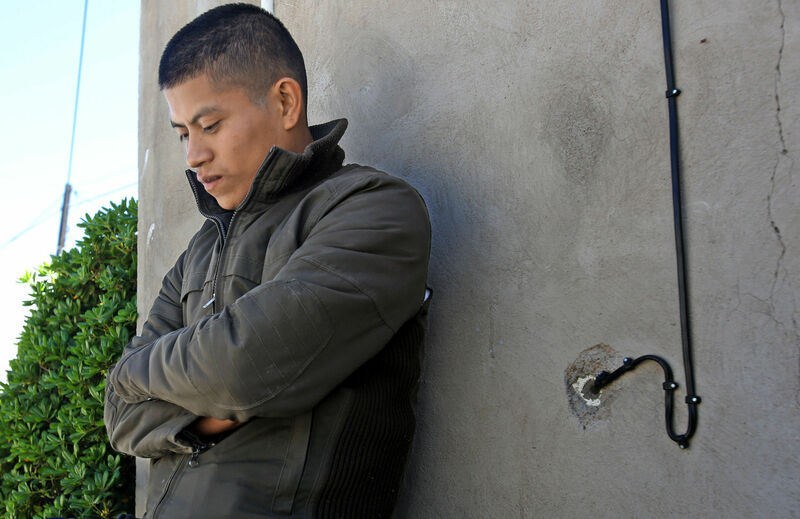 AGUA PRIETA, Sonora — The business of smuggling people across the border is going high-tech. Rather than paying a guide to lead them across the Southern Arizona desert, migrants are hiring smugglers who watch from nearby hilltops and tell them via cellphone when to run, when to stop, when to hide and when to crawl. In places such as Naco, near Bisbee, and Agua Prieta, which abuts Douglas, the use of cellphones to guide migrants started about five years ago. Already, more than three-quarters of migrants who go through the local shelter or resource center are choosing that option, said Adalberto Ramos, who coordinates both places. And now it’s spreading to Nogales. This year, people who work with migrants said they are hearing stories about women taken to a bridge near the Mariposa Port of Entry and held there, sometimes for days, until their smugglers tell them it’s safe to cross. The shift from live guide to cellphone is happening even though it’s more expensive — up to $7,000 versus roughly $3,500 to be led through the desert. That’s because it’s supposed to be a shorter and safer walk to the city from the border fence, which they jump with a ladder and rope. But it’s just one more way immigrants are misled, migrant aid workers said. 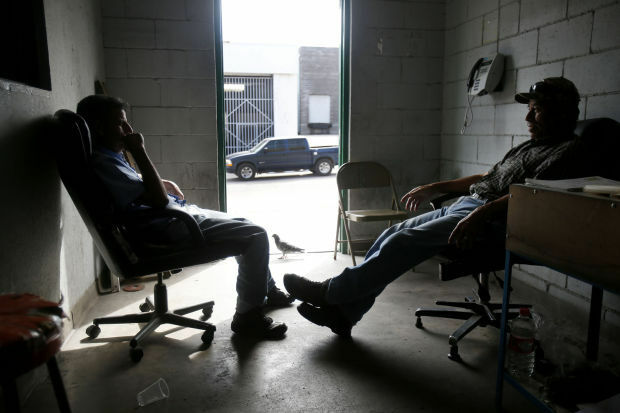 Two former workers for a maquiladora run by Legacy de México waited for customers to come and buy court-awarded assets at the closed factory in Nogales, Sonora, in October. Photo by Mike Christy/Arizona Daily Star. Foreign-owned companies in Mexico can leave the country overnight with few or no consequences. Mexican federal labor laws are designed to ensure that employees are compensated for their work and receive their required severance pay, but in practice a lot is left to the companies’ good will. The best chance workers have to recover severance pay after a company unexpectedly closes is to go immediately to the closest Junta de Conciliación y Arbitraje — the federal mediation council that helps workers and employers negotiate labor disputes — and request an asset seizure. That secures any equipment and materials left behind so workers can sell it. Government officials tout this system as a way to guarantee that employees get paid, but it relies heavily on workers reacting quickly. And there’s no guarantee the seized assets will bring in the money workers are owed. “A lot of times, this machinery is for a very specific task, and it’s very difficult to sell it in the market at real value,” says Rosario Robles, a professor at Universidad Estatal de Sonora who specializes in economic development. Company owners often remove the most valuable machinery over the weekend and then lock the doors before workers show up on Monday. “I see very little recourse for the workers,” Robles says. That’s unlikely to change anytime soon. “This is a very complex situation in Mexico. The same thing happens with financial institutions going broke and leaving their customers in the street,” says Cuauhtémoc Galindo, a federal representative on leave because he’s running for mayor of Nogales, Sonora. Dora Alicia Rojas, left, pours a cup of coffee in a makeshift kitchen as she and other former employees of Legacy de México keep a vigil on the sidewalk in front of their old workplace. Photo by A.E. Araiza/Arizona Daily Star.